Project obstacles and solutions: The East End Crossing connects I-265 on the east side of Louisville, Kentucky with the same highway across the Ohio River in southern Indiana. The $1.1 billion project included a major reconfiguration of the highway to descend into two tunnels before crossing the Ohio River. Between the tunnels and the river was a little more than one mile where the highway crossed rugged terrain, Harrods Creek in two places, along with River Road. Haydon Bridge built the two bridges and Walsh paved this connecting section of the highway. The approach to the tunnel required a complete change of the surrounding landscape, as the bedrock was blasted down to the tunnel level and the area excavated for the highway. The two bridges required a total of eight piers with seven sections connecting them. The early work on the bridge footings and piers were hard to reach due to the ever-changing terrain. IMI drivers, dispatchers and safety personnel worked with the contractors to keep concrete rolling safely to the work site. This also required a close eye on the product by IMI QC/QA personnel. 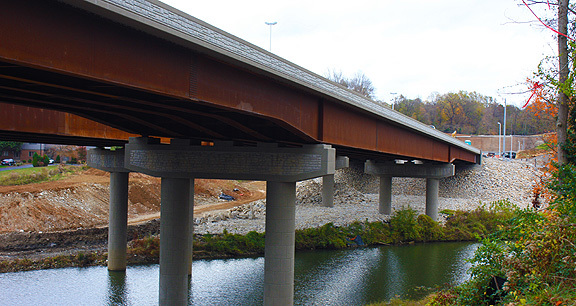 Concrete used in bridge construction has to meet strength requirements, but it also has to be air entrained to counteract the impact of freezing temperatures. The more concrete is moved, the more air it loses. This was especially critical when the decks were being poured. Not only did the jostling of provisional roadways have an impact, so did pumping and placing the concrete. The concrete was pumped from below the deck with a concrete boom pump that delivered to a conveyor Bidwell paver. From the chute of the Bidwell, the concrete dropped four feet to the deck and was screeded and leveled. The specifications called for air entrainment between 4% and 8%. Quality Control kept a very close eye on this as concrete was delivered, making adjustments as pours were underway. The East End Crossing was the crowning achievement of years of planning. Beyond the engineering aspects of blasting two tunnels and changing the surrounding terrain to accommodate the highway, the architectural aesthetics of the new connector were also evident in these two bridges. The walls of the bridges were poured with a decorative concrete stacked stone form that mimicked the decorative concrete work at the entrance of the tunnels. IMI supplied a self-consolidating concrete mix to ensure that all the crevices of these forms were filled to get the desired finished wall. See the photos to the right for details of the walls. The East End Crossing opened for traffic on December 18, 2016. For more information on concrete used for bridge construction, contact the sales representative for the concrete plant nearest your location. Click here.